She is coming into true. This painting started the process of working seriously with my paintings for the 2005 Out of the Ashes Show. 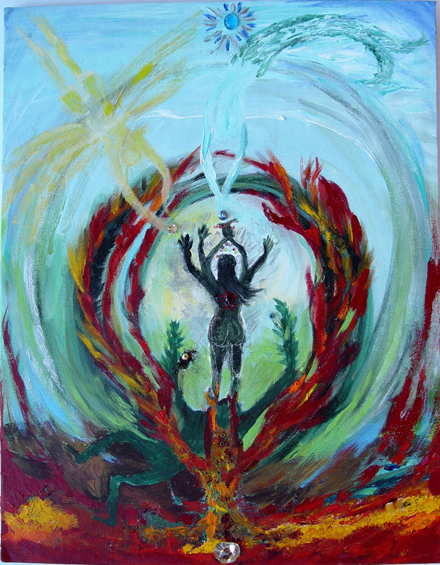 Like the Dark of the Moon painting, she is grounded in all the elements (earth, air, fire and water) and herself becomes what Starhawk calls “the Fifth Sacred Thing.” Spirit. The Goddess incarnate. There is another series of paintings about a little green egg growing in my belly. This is the bursting forth of that egg – a Greenwitch from a green egg. A priestess of Gaia in touch with the mythical Green man below her. In their ecstatic joining we all become one. Many-armed like Kali she calls on the elements to be with her. She is in tune. Written for the Out of the Ashes Show, North County Rec District, January 2005.